First of all, Merry Christmas to all you Chocolate Shavings loyal readers! Your comments have really made this blog that much more fun to write and always gives me that extra boost of energy to sit down and share a recipe I loved, even when my day seemed like it should have been 30 hours long. As much as I love creating new traditions for the holidays (like my Panettone bread pudding and homemade Gingerbread ornaments) I also love upholding old traditions. We serve yule logs, every single Christmas at home, and since I wasn't home this year, I decided to make an old dessert in a new home.. so here it is! Buche de Noel is not nearly as daunting to make as it might seem, especially when you've made it once before. The most difficult part is wrapping yourself around the different steps of the dessert. As its name so blatantly suggests, yule logs are the sweet, edible version of the large wooden logs used to warm cold wintery houses during Christmastime. And as nature intended it, logs are not perfectly symmetrical, have nooks and crannies, uneven edges and aren't perfectly straight. This should all encourage those of us who haven't been baking yule logs since they could hold their first spoon. This dessert is not meant to look perfect, but naturally rustic! Preheat the oven to 350F. Separate the yolks from the whites. In a bowl, mix the yolks and sugar until the mixture whitens. Add the flour and the sifted powdered almonds gradually. In a separate bowl, add the pinch of salt to the egg whites and beat until the mixture forms stiff peaks. Gently fold the whites into the yolk mixture until the mixture is homogeneous and smooth. Mix the 1/2 container of mascarpone and confectioner's sugar in a bowl while the cake is baking. Fold in the crystallized ginger. Melt the chocolate and leave to cool. Beat the remaining mascarpone with the cream, pinch of salt and confectioner's sugar until smooth. Fold in the chocolate when it is cool enough so it does not melt the mascarpone. Unroll the cake and gently spread the ginger/mascarpone mixture on one side. Make sure the layer is even and lave a small border. Gently roll the cake up again. An additional, optional step is to wrap the entire cake in plastic wrap, twist it at the ends, and let sit in the fridge for 20 minutes to compress the layers together. Cover the cake with the chocolate/mascarpone mixture. Top with toasted almonds and decorate as you please. Enjoy! I love chocolate and ginger combos...getting ready to do it today... Lovely. Truly nice work. Merry Christmas to you too! 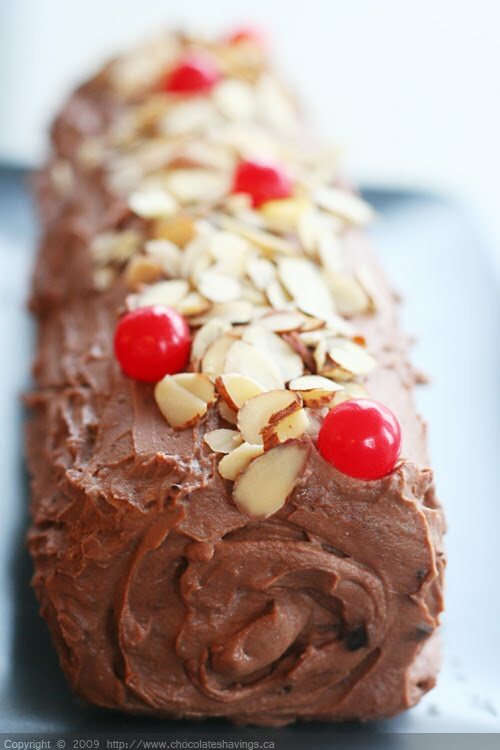 Your Buche de Noel looks very pretty - lucky whoever gets to eat this! I have never tried ginger and chocolate... great idea for a holiday standard. Bravo and happy holiday. just a little slice please, as I have been eating non-stop all day. Love the combination and presentation !! Merry Christmas! It is beautiful! I hope you had a wonderful Christmas! It's beautiful. Love the colors and flavor combo. It makes me wish I had made one. Beautiful and love chocolate and ginger combo! happy holidays! Wow...this sounds like the best buche Noel I've seen in the entire blogosphere! I really wanted to make one, but ran out of time. I will definitely bookmark for next year. What a gorgeous Buche de Noel you made! I hope you had a wonderful Holiday! My husband just asked me last night why I didn't make a Bûche"! Yours looks luscious and I love the recipes. This is one I must try! Happy Holidays! Jamie: I hope you get to try it! It's a great dessert to serve for the holidays. I am also in the midst of testing recipes for roulades that can be enjoyed at other times besides Christmas! I was thinking of trying to make one this year. Look at those cherries -- such a pretty touch. Beautiful cake! And I will copy it for next year. We are stuffed around here! Hope you had a Happy Christmas! Your buche de noel is sooo lovely! The combo sounds heavenly as well. I need to make one next year and incorporate it into our family traditions! Thanks for sharing!! Hope you had a lovely holiday. OK, the yule log is meant to have it's visual imperfections to mimic a tree.....but this recipe sounds like pure, perfect satisfaction!!! Love the idea of the powdered almond in the genoise and the mascarpone and crystallized ginger in the filling. Can we make this cake all year long???!! How very festive and wonderful looking this is....It is simply gorgeous! wow...what a combo! I love both!!! I always wanted to make one but again forgot this year until it was too late. But I made long Pooh House covered in chocolate. Beautiful Bouche. I've always wanted to make one, but have never gotten around to it. I hope you have a healthy and happy new year. How incredibly delicious is this? I'll take one large slice. I hope you and yours have a very Happy New Year! "Boosh Day Noel" in my head. I am pretty sure I would breaking some sort of french baking law if I even got near this sweet and sophisticated recipe.